Walker Zanger received a prestigious Macael Award for its use of Andalusian marble within the new Prudential Financial tower in New Jersey. 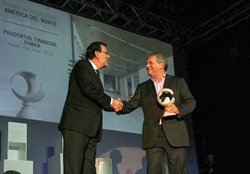 Prime Minister of Spain Mariano Rajoy recognized tile company Walker Zanger with a prestigious Macael Award for using Andalusian marble within the new Prudential Financial tower in New Jersey. Presented in Macael, Spain, only one project from each continent was selected for the award, and Walker Zanger was one of only two companies to be personally awarded by the prime minister. Walker Zanger—the world’s most comprehensive stone and tile company—provided approximately 80,000 square feet of Blanco Beatriz marble for the building’s lobby walls, server walls, elevator lobby walls and full cladding for the centerpiece of the 20-story interior atrium. Additionally, 30,000 square feet of Nimbus Grey paving was used for the lobby floor and exterior floor and base, and 5,000 square feet of Bianco Fino marble was used for the first-floor elevator lobby. As a result of the project’s success, Walker Zanger now stocks varieties of Blanco Macael marble. The company also supplied more than 50,000 square feet of porcelain tile for the bathrooms and elevator lobbies—one for each floor of the 20-story, state-of-the-art, eco-friendly building—which were designed by the world-renowned architectural firm Kohn Pederson Fox. The Macael Awards were created in 1985 to recognize professionals in a variety of industries including craft, design and architecture that contribute to projects in the natural stone sector. The Macael Awards have become the most important event for the natural stone industry, honoring international projects in several categories over the past 29 years. To learn more about Walker Zanger and its awards, please visit walkerzanger.com. For more than 60 years, Walker Zanger—the world’s most comprehensive stone and tile company—has combined traditional tile-making techniques with a modern sophistication that transcends any singular design style. A leading choice for design professionals and consumers, Walker Zanger natural stone and tile products can be found in luxury homes, trendy boutiques, lavish spas and resorts, famed museums and fine restaurants around the globe. Walker Zanger is available through 14 beautiful showrooms and more than 150 authorized dealers nationwide. To learn more about Walker Zanger and its line of products visit http://www.walkerzanger.com.